This beautiful tapestry "Chase Napolean" shows a work inspired by Carle Vernet, a prized artist to Napolean. Vernet (1758-1836) was born in Bordeaux and later in his life produced works which portrayed Napolean. Here we see the emperor and his men of the court, watching a stag in the Compigne forest. The forest of Compiegne is the largest forest in Picardie, north of Paris, and was a favorite hunting ground of the Emperor with its abundant forest area. The forest also hosted many parties and formal occasions as well as serving as a hunting ground. Here we see the activity of the hunt with the hounds chasing the stag in the centre of the scene. The details in the forest are exceptionally exquisite with grey green foliage beautifully rendered. 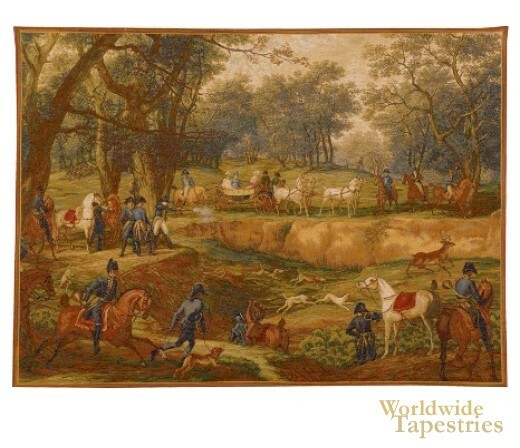 This landscape art tapestry "Chase Napolean" is backed with a lining and has a tunnel for ease of hanging.